With a 41-megapixel camera capable of taking phenomenal photos, the Nokia Lumia 1020 is the Windows Phone to beat. Read our NOkia Lumia 1020 review to find out more. They say the best camera is the one you have with you. In the case of the Nokia Lumia 1020, you might as well be carrying a high-end point-and-shoot in your pocket, as the phone’s 41-megapixel camera outclasses the shooters on both the Apple iPhone 5and the Samsung Galaxy S4 by a good long mile. Nokia has always emphasized its phones’ camera capabilities, and the Lumia 1020 is no exception: Along with the crazy megapixel count, the phone features a custom camera app that has functions never before seen on a smartphone. But for all these advancements, the Lumia 1020 sometimes feels rough around the edges, and a handful of problems keep it from attaining perfection. The Lumia 1020 is essentially a Lumia 920 with a better camera tacked onto the back. The phones share some design elements—such as a rounded chassis and a large, 4.5-inch screen—although the 1020 doesn’t feel as chunky when you hold it in your hand. This phone is slimmer than the 920, but the camera on the rear of the 1020 protrudes a bit and can make the handset feel awkward while it’s resting in your pocket. That isn’t a deal breaker, necessarily. It’s just something to keep in mind if you tend to wear skinny jeans. (The camera housing will dig into your thigh every time you sit down.) See also: Nokia Lumia 925 review. The Lumia 1020 boasts a display resolution of 1280 by 768, which would have been fine had the phone launched a year ago. Nowadays, with everyone and their mom making smartphones touting 1080p displays, it’s disappointing that Microsoft has yet to update the Windows Phone OS to support higher resolutions. The screen on the Lumia 1020 is acceptable for watching movies or playing games, but it would have been nice to have a sharper display available for viewing photos shot with the phone’s impressive camera. 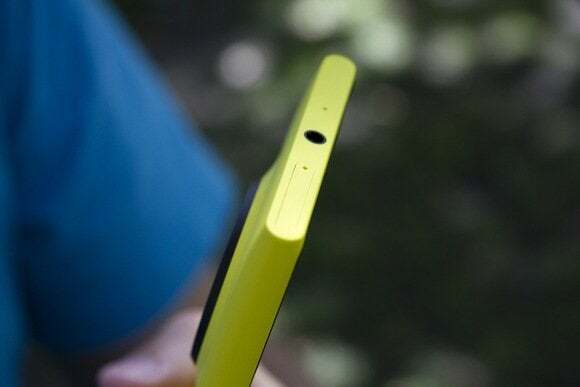 The Lumia 1020 could have been the first Windows Phone with a 1080p display, and the fact that it isn’t feels like a missed opportunity for both Nokia and Microsoft. Looks aren’t the only thing the Lumia 1020 has in common with its 920 predecessor: Aside from a slight bump in RAM, the two phones use the same 1.5GHz Snapdragon S4 processor and ship with 32GB of internal storage. Although the Windows Phone OS runs fine on this somewhat antiquated hardware, I found that taking a lot of photos and videos would cause the phone to become notably hot to the touch. The two games I played, Jetpack Joyride and Radiant, worked flawlessly but didn’t look as good as their iOS or Android counterparts. Call quality over AT&T’s network in San Francisco was good, with no hints of hiss or static. Obviously call quality will vary depending on where you live, so be sure to consult coverage maps to make sure you aren’t in an AT&T dead zone. The phone’s 2000mAh battery held up through an entire day’s use, though I noticed the charge level drop rapidly the moment I started taking photos. Packing a charger may be worthwhile if you’re going sightseeing and planning on using the phone as your primary means of capturing memories. Perhaps the biggest drawback of the Lumia 1020 is that it uses Microsoft’s mobile OS. Although Windows Phone 8 runs buttery smooth, going through the Windows Phone Store in search of apps is downright depressing: A lot of the top-rated offerings are either apps made by Microsoft or games that have been ported over from iOS. I thought it was amusing that one app in the top-ranked section, when I checked the store, was designed to display a photo of the iOS home screen so that you could “trick” your friends into thinking you had an iPhone. Wow. Although Nokia bundles a number of useful camera and photo apps with the Lumia 1020 (more on those in a bit), trying to find anything worthwhile in the store is a fruitless endeavor. At the time I searched, I saw a number of third-party apps that let you access services such as Instagram and Vine, but they just don’t work as well as the real deal. Right now, the Lumia 1020 is one official Instagram app away from being the best smartphone for photos, period. Only time will tell if such an app ever makes its way to the platform. I could go on and on about how good the camera on the Lumia 1020 is, but maybe it’s better if I show you a picture instead. When you take a photo, you actually end up with two images—one at full resolution and a 5-megapixel resampling of that image. The Lumia 1020 creates the 5-megapixel version so that you can share the photo via email, through text, or over your social networks, as trying to upload an album full of 10MB-plus images over a cellular connection would be a huge pain. You get access to both versions of your photos when you plug the phone into your computer, but you have no real way to access both images directly from the phone. Deleting an image from your camera roll deletes both the full-resolution photo and the 5-megapixel resampling, so you’ll need to hook the phone up to a computer if you want to save one versus the other. The Lumia 1020 comes with three separate camera apps: the standard Windows Phone Camera app, Nokia Pro Cam, and Nokia Smart Cam. Holding down the phone’s physical camera button automatically launches Nokia Pro Cam, and I couldn’t find any way to change this default in the phone’s settings. Not that you’d want to use anything other than Pro Cam, anyway: The app lets you adjust your camera’s ISO and shutter speed, and even features a rudimentary manual-focus mode. The biggest drawback to using Pro Cam, however, is that it’s slow to launch and often requires a few seconds to start up fully. It also takes a considerable amount of time to save and process photos, meaning that you have noticeable downtime between shots. Nokia Smart Cam is similar to the Zoe shooting mode on the HTC One. Smart Cam takes multiple photos in rapid succession and gives you options to remove unwanted objects from the scene. Smart Cam also comes in handy with group shots, because you can meld those multiple photos together to create a single image in which everyone in the group is smiling and has their eyes open. The app works pretty well, but you’ll need to make sure that you’re holding very still while taking photos—the slightest movement can throw off the process, leaving you with a bunch of mediocre images. The Nokia Lumia 1020 faces an uphill battle: Not only is it competing against heavyweights such as the Galaxy S4 and iPhone 5, but it is also fighting against the stigma surrounding the Windows Phone OS. The Lumia 1020 is an excellent phone with one of the best all-around cameras out there, but its AT&T exclusivity and older hardware make it a hard sell. If you’re an AT&T customer who has been curious about Windows Phone, I strongly urge you to pick up the Lumia 1020. For everyone else, you’ll have to ask yourself whether a fancy camera and the struggling Windows Phone ecosystem are enough to break your contract over.